If you're at all like me, you've spent many an hour dreaming of ways to make your yarn habit pay for itself. But how? There's the knit-things-for-people-on-commission route, but let's face it -- nobody wants to pay what you would really need to charge. "$50 for a pair of socks?? I can buy 3 pairs for $5!" That sort of thing. A better option came to me, but I quickly dismissed it as a ridiculous fantasy. Designing? Would anybody actually PAY for something I came up with? I doubt it. But the idea kept nagging at me. You're a good knitter. You can do math. Give it a try. So I did. And it worked. The upside of selling patterns, either through your own site or someone else's, is that the amount of money you can earn from a single pattern isn't limited. There is, however, the risk that no one will buy it, and you will earn nothing. That's where magazines come in. Magazines, both print and online, will usually pay you a set fee for your design. While online magazines generally pay less than print magazines, they are also a bit more accessible to the novice designer. Some do not pay their contributors at all. Generally, online magazines allow designers to retain copyright to their designs, a plus if you wish to offer the pattern later on your own website. Print magazines, however, vary -- some just want the rights to publish it first (they later revert to you) while others want all rights to your work. Whether retaining the rights is important to you is a personal decision, and you can always try to negotiate any terms you're not comfortable with. While seeing your work in magazines is probably the most satisfying, a more steady outlet for your work can be found designing for yarn companies. Some companies seek submissions only a few times a year, while others accept designs on a continual basis. Payment for designs tends to be comparable to that of print magazines, and once you develop a relationship you can expect to receive samples of new yarns to experiment with -- a definite plus. You've considered your options, you have plenty of ideas -- how do you know where to send them? It is true that what is rejected by one magazine/yarn company can be adored by another. The key is understanding the style of the publication/company to which you are submitting. Spend some time looking at the kinds of designs each publishes. Which best fits your style? Next, you need to find out what the magazine/yarn company needs. If you believe that designing is only about artistic expression, you'd be better off publishing patterns yourself. The desire to SELL YARN or AD SPACE is in the minds of many editors and creative directors, and knowing what they are looking for will greatly increase your odds of being accepted. Check magazine websites for "submission guidelines" and "editorial calendars". Armed with this information, you are ready to start designing. Submission requirements vary, but in general you need to provide a sketch, a swatch, and a written description of the garment. The nice thing about this is that you can send a proposal without a huge investment of your time or money. Buy a skein of yarn you like, get out the colored pencils, and put some ideas together. If you lack artistic ability, you can find books on figure drawing at the library or bookstore to help you, but remember -- editors are not expecting a masterpiece. A clear, neat drawing that shows the details of the garment is all you need to do. Generous swatches are preferred, so don't rush it -- six inches square is a good size. Be sure to block them! For the written description, focus on what makes your design unique and add more information about the details shown in your swatch. To make a decision, editors need to have a good sense of what the finished item will look like. Once your submission is complete, make sure you label EVERYTHING with your name, address, phone number, and email. Drop it in the mail (in some cases you can photograph your swatch and scan your sketch, and send it electronically) and wait. And wait. And wait. Sometimes it can take up to six months to hear back, so you need to be patient. When it takes a while, that can be a good sign -- they are seriously considering your work. When you finally get the good news, be prepared to work fast. Print magazines in particular have tight schedules, and often ask that the finished sample and pattern be in their hands in as few as 3-4 weeks. Add to that the time for the yarn to be shipped to you (at no cost to you, of course!) and you are going to have some late nights. Some designers hire sample knitters to do the dirty work for them, but that will really cut into your profit. Remember too, if you want to get paid, you need to prepare and send an invoice with the finished work, as well as return any contracts that were sent to you. Once the finished work is in the editor's hands, keep yourself available and check your e-mail regularly. Often, questions will arise during the tech editing process and you will need to answer them -- promptly. Finally (and depending on publishing schedules, this can be as much as a year later) the day comes. You get to see your work in print! Magazines often send you additional copies of the issue so you can show it off to your friends and family. Publishing in magazines is fun, but if you can't (or won't) take the breakneck pace, self-publishing or designing for yarn companies might be a better choice. Yarn companies frequently ask YOU to quote a completion date, so you can take your schedule into account. Be realistic, but also courteous -- they want the finished product as soon as possible, especially if there's a trade show or other event coming up. A final word of advice? The best move I made when diving into the designing world was to join the Professional Knitwear Designers Guild. They offer a mentorship program that was invaluable in helping make contacts with yarn companies, know which magazines to approach first as a new designer, and a lot more. Look on their website for information on how to apply. It may sound trite, but you'll never succeed if you don't try! Editor's note: To learn more about the unique design submission process at Knitty magazine, including our submission requirements, designer compensation and rights, visit our submission guidelines page. 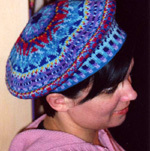 Amy has had over 15 designs accepted for publication in print magazines, online magazines, and with yarn companies since she started designing in 2005. By day, she is a mild-mannered elementary school teacher in suburban Detroit.